Although gray is the color associated with brain tumors, our group is often seen wearing green. In 2011 Patrick participated in the first St. Patrick’s Day/St. Baldrick’s Day event held at St. Barnabas School in his honor. He was very sick at the time having just come home from the hospital the night before after a lengthy stay. But still he had a great sense of humor and was very excited about the event. He came down from his room dressed in a bright green tee shirt, a bow tie, shamrock sunglasses, and an oversized leprechaun hat. The enthusiasm at the school was on overdrive. He later told a teacher it was the best day of his life. Patrick died seven months later from the ravages of the brain tumors. 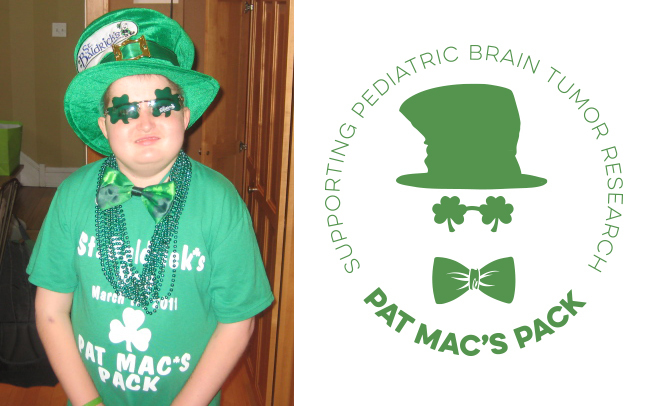 The image of Patrick dressed up on this day became the inspiration for our foundation’s logo. Patrick’s memory is our driving force to find a cure for this devastating disease. ©2015 Pat Mac’s Pack - All righs reserved.